Sprinkle 1 package of dry yeast over a half cup of warm water in a large bowl and wait for it to dissolve. Meanwhile melt a stick of butter, add 2 cups of milk and allow it to just gently warm up. Add it to the yeast mixture. Mix a teaspoon each of salt and sugar into 2 cups of flour. Add this to the liquid and beat until smooth. Cover the bowl and let it stand overnight at room temperature. In the morning beat in 2 eggs and a quarter teaspoon of baking soda, stirring well. Cook on a very hot waffle iron until crisp on each side. This makes about 8 waffles, and will keep for a few days in the refrigerator. 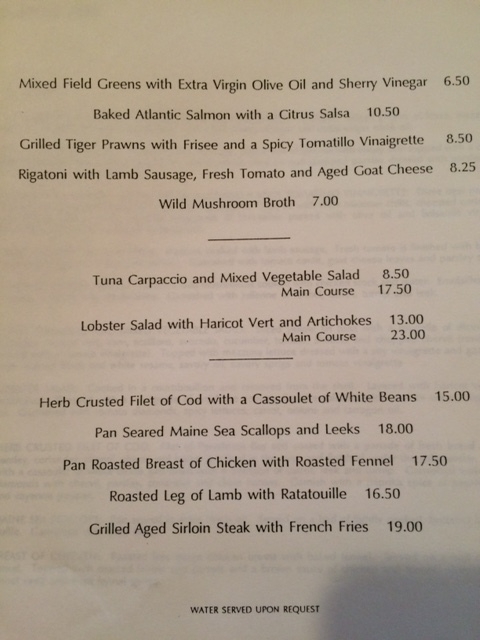 Just found a folder of menus from my years at the Los Angeles Times. There’s this one, from the old Spago (Wolf actually drew the cover himself), long before it moved to spiffy new quarters in Beverly Hills. 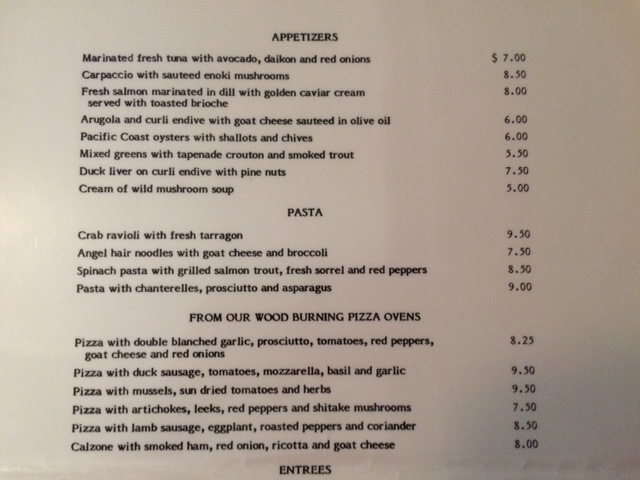 This may be the first menu, although I’m not sure about that. 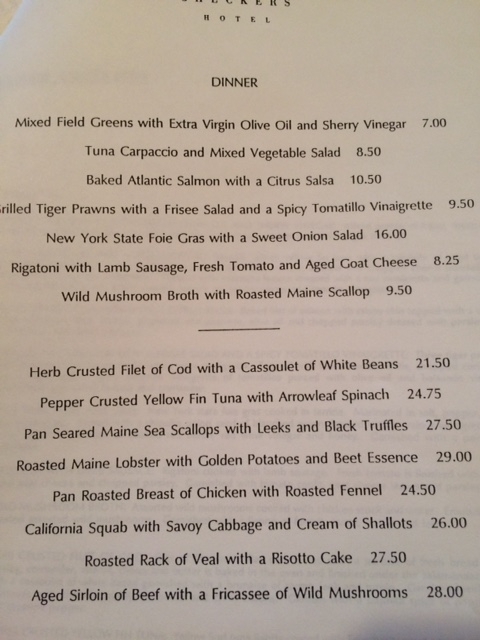 Note that the highest priced entree is $14.50. 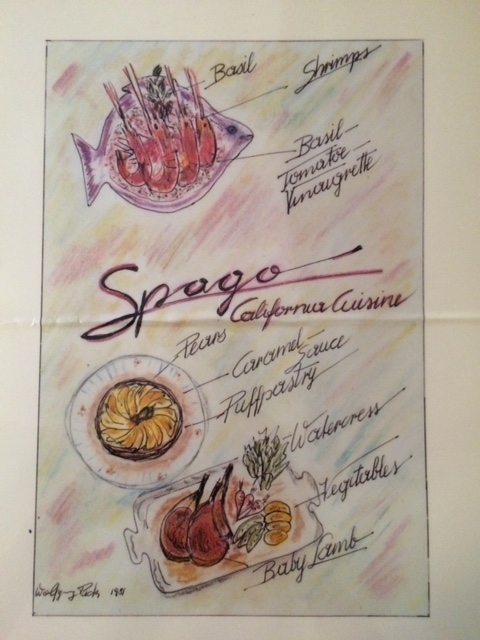 Then there are these menus from Thomas Keller, long before he went on to French Laundry fame. I was a big fan of his food at Checkers Hotel in downtown Los Angeles, but the restaurant never really took off. 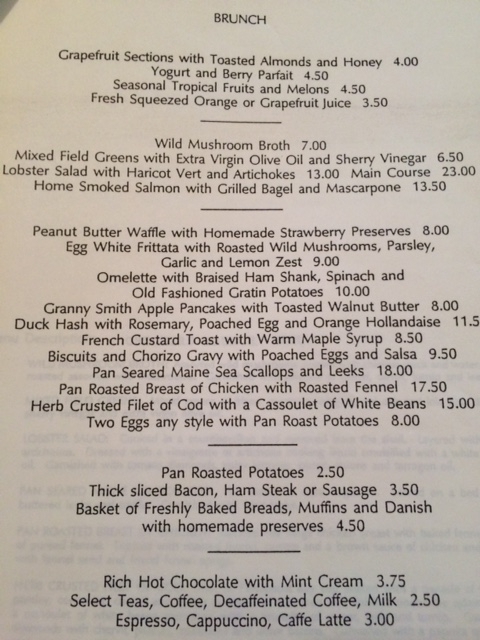 One interesting note: look how much more adventurous Keller let himself be with brunch. Duck hash; chorizo gravy; peanut butter waffles. I’m crazy about my vintage cast iron waffle maker. (Not pictured.) It’s turned out perfect waffles for 40 years. It barely needs cleaning. And it makes heart-shaped waffles that are, frankly, adorable. My most satisfying breakfast ritual begins with hauling the huge base – it must weigh at least five pounds – up to my stovetop. When the pan begins to sing with heat I cover it with Fannie Farmer’s yeast-raised waffle batter, carefully close the top, and wait. When the top rises just a bit I turn it over and wait some more. The truth is that my well seasoned griddle cooks waffles almost as fast as my family can eat them – which is very fast indeed. They are always gone too soon. The only catch? My little Jotul waffle iron is no longer made, and the last one I found on Etsy cost way too much. But I’ve just found a great buy on a humble version of my stovetop wonder. It has no base. The triangles aren’t hearts. But it’s also 24 bucks, and pure cast iron. And just to encourage you, here’s the time-honored Fannie Farmer Recipe, which makes light, crisp airy waffles that nobody can resist. Cover the bowl and let it stand overnight at room temperature. In the morning beat in 2 eggs and a quarter teaspoon of baking soda, stirring well. Cook on a very hot waffle iron until crisp on each side. Note: If you want to make waffles the same morning you make the batter you can speed up the sponge process. Place the covered bowl with the yeast mixture in a larger bowl of warm water for an hour, or until doubled, and proceed with the recipe. There is nothing as luxurious as a really great waffle. On this snowy morning the knowledge that a big bowl of waffle batter was slowly puffing itself up in the kitchen propelled me right out of bed. I'm a longtime fan of Fannie Farmer's classic yeast waffle recipe, which I first encountered in Marion Cunningham's wonderful The Breakfast Book. But this is a new twist: I used rice flour instead of wheat. The result: waffles so light they seemed to float off the griddle and hover in the air. Waffles so light they dissolved the instant they hit the tongue. Many thanks to Anson Mills, whose 13 colonies rice waffle flour is unlike anything I've used before. Like Sean Brock (with whom they've partnered), Anson Mills has embarked on a quest to bring back the heirloom crops of the antebellum Carolina rice kitchen. They've searched through seed libraries, looking for southern crops that disappeared with the industrialization of American farms, and brought them back. Take a look through their site; this is is agricultural history at its most intriguing. This rice flour is specifically intended for waffles, which were extremely popular in the old south, and often served at dinner with fried chicken. Personally, I prefer them in a starring role at breakfast. A perfect start to the day. Note: Anson Mills cuts this rice flour with pastry flour. If you’re using ordinary rice flour, be sure to use half rice and half wheat flour. Dissolve 1/2 teaspoon instant yeast and 1/2 teaspoon sugar in 1/2 cup warm water (be sure the water is not too hot or it will kill the yeast). Set aside. Whisk the flour, salt, and remaining tablespoon of sugar in a large bowl. Slowly melt half a stick of butter, allowing it to turn a slight, nut-like brown. Remove from the heat and stir in the milk. When it's cool enough to stick your finger in, add the yeast mixture. Stir the liquids into the flour, mixing well. Cover the bowl with plastic wrap and leave on the counter to rise overnight. The next morning, stir in an egg and 1/2 teaspoon baking soda. If the batter feels a bit thick, add up to 2 tablespoons more milk. 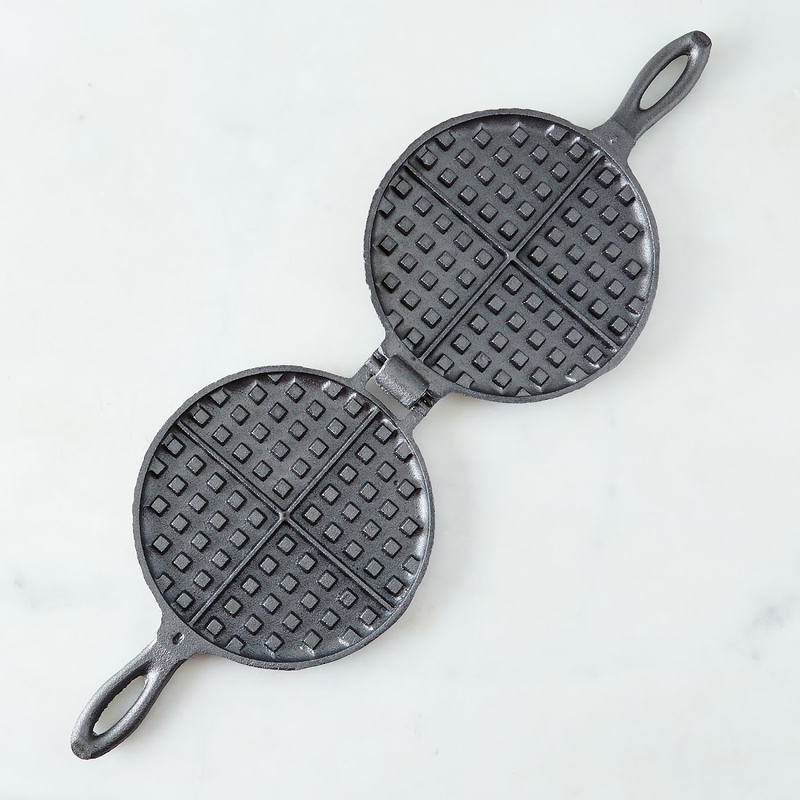 Pour batter into a hot waffle iron: how much batter you use will depend on the size of your iron, but in my old fashioned cast iron waffle iron it makes about 7 waffles. Eat with maple syrup, apple syrup or, in true southern fashion, sorghum. 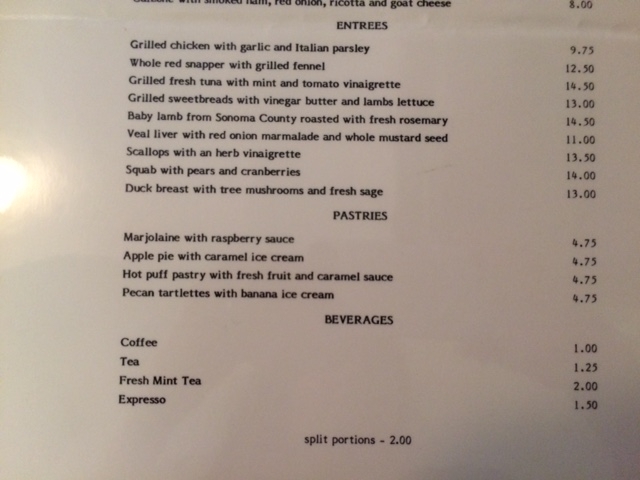 Or simply eat the waffles piping hot, unadorned, with your fingers.